Catalyst Learning Center (CLC) is a Minnesota-based non-profit that provides homework help and math tutoring services to predominantly teenage public school children. CLC needs to maintain more accurate and consistent records of tutoring sessions, in order to gather outcomes-related data when seeking funding opportunities. 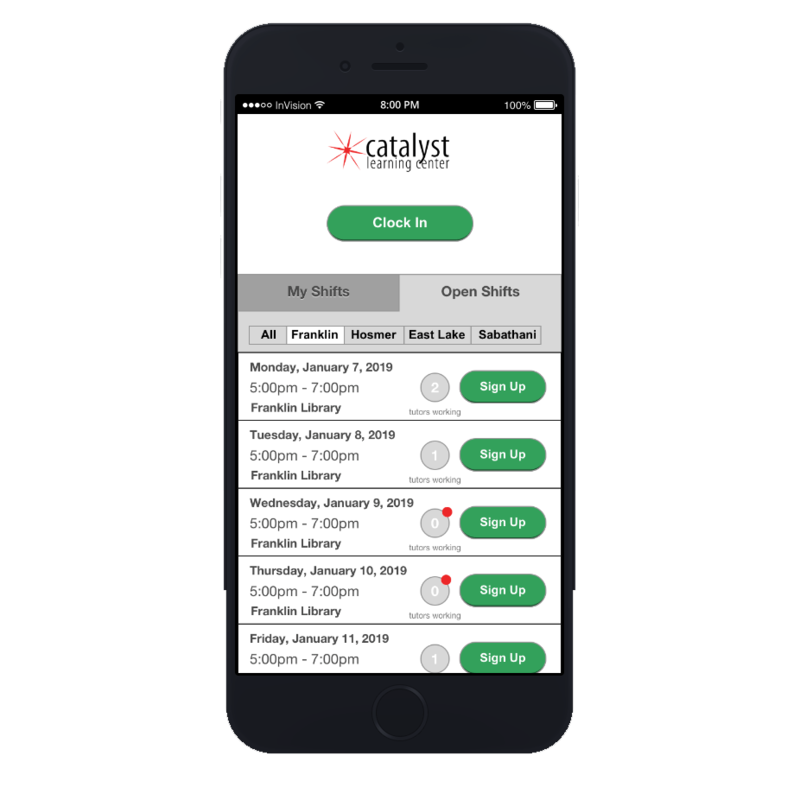 In addition, Catalyst is a growing organization, needing to coordinate tutor schedules between an expanding roster of locations. Created wireframes and prototype to solve scheduling and tutor session tracking problems for the organization. 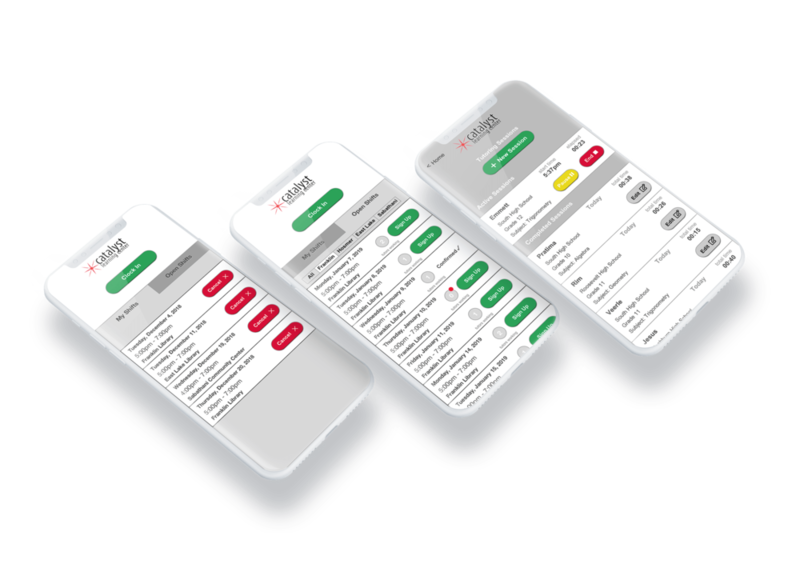 A cognitive walk-through provided insight into the existing site’s pain points and functionality limitations. On-site contextual Inquiry revealed some of the tutors’ critical needs: a simple mobile-friendly platform, scheduling functionality, and better controls for tracking each individual tutoring session. In a noisy work environment where each tutor was sometimes helping as many as six students, we could tell that speed and simplicity were a high priority. 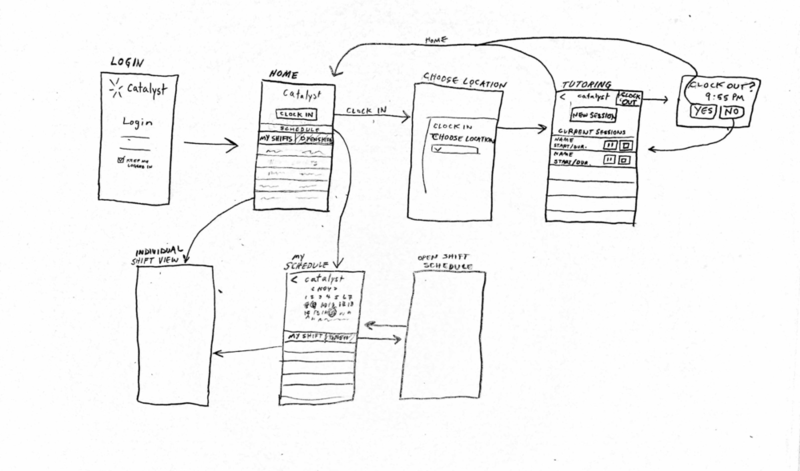 A rough screen flow sketch focused on meeting the users’ needs with a few easy to navigate screens. The goal is to minimize cognitive load and maximize the tutors’ ability to focus on their work. Because the tutors are motivated by service, red dot badges show shifts where no tutors have signed up yet — giving tutors an opportunity to easily find out when their help is most needed. For convenience, a filter bar allows tutors to filter shifts by location. A ‘pause’ button is one simple addition that will save tutors extra data entry during their busy shifts. When a student returns for multiple shorter sessions within a day, the tutor can play and pause one active session instead of having to re-enter the student’s data each time they return. The ability to edit completed sessions ensures the tutor has the control they need to correct errors.